Foundations will be laid on Sunday for the new Atatürk Cultural Center building. The groundbreaking ceremony for the modernization work at Taksim's Atatürk Cultural Center (AKM) will be held on Feb. 10, with President Recep Tayyip Erdoğan in attendance. Once completed, the renovated AKM will be one of Istanbul's most popular landmarks. The capacity of its opera hall will be raised from 1,300 to 2,500. The hall will have natural acoustic like classic opera buildings. The secondary spaces of the venue, including a number of smaller concert halls, theater halls, cinema halls, libraries, and design shops along with cafes and restaurants, will be built on the store and car park areas, which have remained out of use for years. The facade of the building will be a huge screen that would show programs. 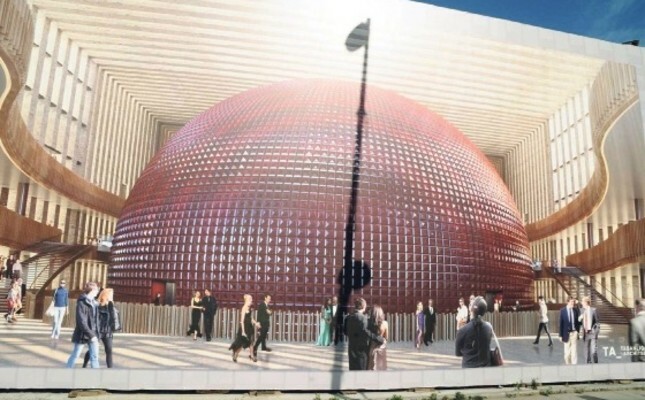 A new building, which will be constructed as an extension of the present AKM, will house an 800-seat theater, 1,000-seat conference hall, 285-seat cinema and a 250-seat smaller theater, an exhibition hall, a library and an 885 capacity car park. They will be located in different places throughout the Cultural Center Street. On top of the building, there will be a restaurant that will have a stunning panoramic view of the Bosporus. Domestic products will be used in the construction of AKM. Designed by architect Murat Tabanlıoğlu, the building will open in two years. President Erdoğan speaking at the introductory ceremony for the AKM project on Nov. 6, 2017, said: "We will not see vehicles on Taksim Square. The traffic will continue from Gümüşsuyu to Taşkışla underground. There will be no traffic in front of the AKM. Taksim Square will only be for pedestrians." Some 2,500 people will be able to watch the program inside. The people outside will have an opportunity to follow these programs on the giant screen installed on the facade of the building.